Universities in Japan lack adequate resources for people with physical disabilities. Mark Bookman at the National Diet Library in Tokyo, Japan. Photo courtesy of Mark Bookman. Michiko Noboriguchi, a social worker from Japan who has cerebral palsy, a physical disability that confines her to a wheelchair, recalls the concerns she went through before attending college in Japan. “I needed to prepare for support to go to a bathroom before I graduated from high school. But there are no universities which have any system to apply assistants for people with physical disabilities in Japan … I had to book a taxi to go to and from a university on my own,” she said. Noboriguchi graduated from Sapporo Gakuin University in Northern Japan. She said many universities in Japan lack adequate resources for people with physical disabilities. She is not alone. The obstacles Noboriguchi experienced can be common for many students in Japanese universities due to the lack of accessibility. 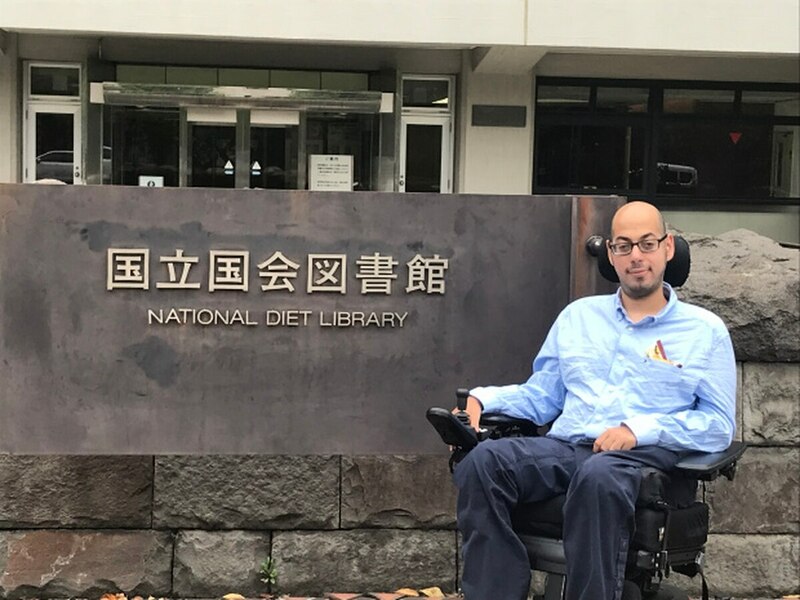 Mark Bookman, a research fellow in Japanese Studies at the University of Tokyo who also relies on a wheelchair, resonates with Noboriguchi’s difficulties. While Bookman studied across four Japanese universities, he said there were few central offices for students with disabilities to access resources like housing or classroom accommodations. "In a lot of cases, it's just run through standard faculties and you ask for the accommodation and the professor rounds with other professors and has a consultation meeting, and they decide if it's okay or not. And that was true at least when I was here in 2014," he said. Laws in Japan are vague when it comes to detailing specific resources that universities must have in place for students with disabilities, according to Bookman. “Generally speaking, a lot of students don’t necessarily have access to those type of resources. Schools can provide braille tests or braille, or scribes for students who can’t write and in a lot of cases they do. But the boundaries of what is a reasonable accommodation are very hazy,” Bookman said. While the Act on the Elimination of Discrimination against Persons with Disabilities (the Disabilities Discrimination Act) requires Japanese public agencies and private business to provide “reasonable accommodation” to those with disabilities, there is no clear definition of “reasonable accommodation” under the law. Aside from the practical obstacles, there is also a lot of stigma surrounding people with disabilities in Japan. Noboriguchi knows this firsthand. When she tried to get support from her classmates, she was instantly rejected. These questions came from a fellow university student, who disagreed with her advertising efforts to get assistance from students. Although the university provided accommodations for students who are deaf, Michiko’s request for assistance was rejected. Her experience is reflective of the haziness around Japan’s disability laws. Noboriguchi said she applied to college even though she wasn’t sure how she should prepare for assistance. “If you want to get any jobs and have a dream, you should try to go to college or university,” she said. Both she and Bookman hope by sharing their experience, they can raise an awareness about the challenges facing students with disabilities to get higher education in Japan and push the boundaries of available campus resources for them.